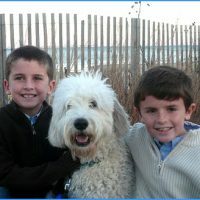 We are so truant in thanking you for the most wonderful dog we have ever had! 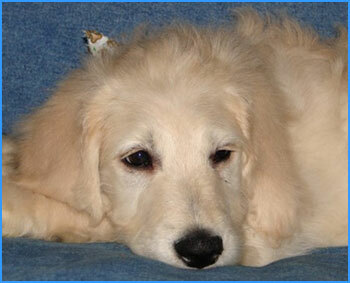 Our beloved Stella is now 5 years old -- she was born on June 9, 2008, one of a litter from Daisy and Teddy Bear. When we picked her up that Labor Day weekend, John kindly met up with us in Frederick so that we would have less of a long trip from NJ. Stella is the perfect blend. She is so sweet, and very, very smart (knows each of her toys by name). She loves people. She loves other dogs. She is an athlete who will play catch with a tennis ball for hours...and a princess who loves to curl up next to her humans and cuddle like a lap dog. 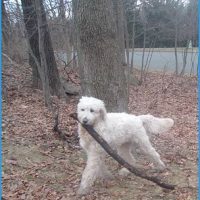 She is known by almost everyone we meet along our walks -- the park regulars, our town police officers, our municipal employees...everybody knows and loves StellaDoodle. They stop to wave from their car, or walk up to give her a pat on the head. Whenever someone says, "Oh she is so pretty! ", we respond "Yes, and thank you, but she is not just a pretty face. She is a really good girl." Every year, a friend who visits at Christmas says to me, "Do you ever write to those folks at Laurel Ridge? Because they need to know that they are doing what they do to perfection". And every year I mean to write, but then the days fly away from me. So here it is, one of my 2014 resolutions: to finally write, and to thank you from the bottom of our hearts. Just thought I would send along a couple of pictures of Cooper. She is such a delight and small like we had hoped for. She weighs in at about 30 pounds and has become quite a lap dog. She also has a delightful personality and enjoys playing with all of the grandkids. Thanks for letting us adopt her. 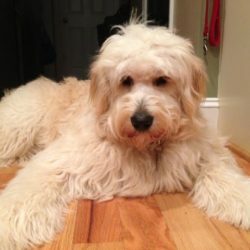 I wanted to THANK YOU, for the wonderful puppy that you provided for us in August last year. Wilson was born on 7/11/12 as the papers you gave us so I figured today would be the perfect day to let you know how Wilson is doing. He has changed our life for the better in so many ways. Thank you for the service that you provide bringing such wonderful dogs in to the world. I have attached some of our favorite pictures for you. Feel free to use them on your website. 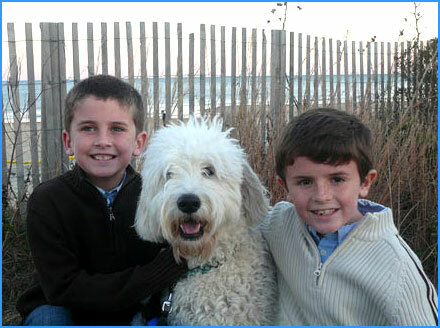 We are glad to hear that "Toby" found a home where he could be happy; he was always very loving and sweet. We loved him and often wonder how he would have done, if we had kept him. However, we also LOVE our Chase!! Chase is a BIG boy; he isn't fat, just very thick!! We often joke that we should have named him "Bear", because that's what he looks like, a big Polar bear. He very laid-back, but loves to play. He thinks he's a lap dog and loves to cuddle; can't seem to get close enough, burrows right into you. 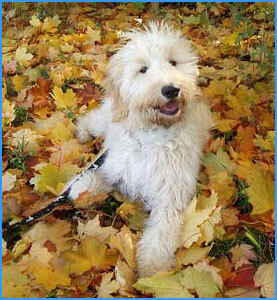 He is my baby, always at my feet; it will be nice this winter, my own personal foot warmer!! 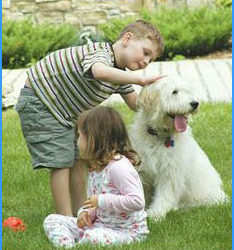 He is very gentle and patient with the kids; just a dream dog. We couldn't ask for a better dog. In fact, I have considered taking the classes, so I could take him into the pediatric wards of our local hospitals. I know the kids would love him and I think he has a great personality for it. Mya is a wonderful dog, too. She has a totally different personality. She is VERY active and LOVES to be outside (we are fencing in our backyard this winter). We have a huge yard (3 acres, half is cleared and the rest is wooded). Mya did great staying in the cleared area of the yard at first, but once she realized she could run and we couldn't catch her, it was over. 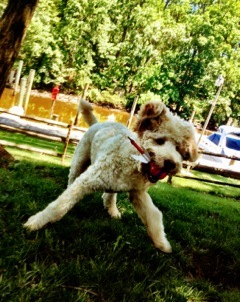 She lives to play fetch; she will chase anything - balls; frisbees; sticks; you throw it, she'll chase it!! She is also very sweet, but rarely settles long enough to be cuddly. She will stand still for hours, as long as, you to scratch her back!!! In the evenings, she will lay down beside you, but isn't interested in being in your lap like Chase. 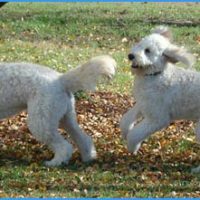 We took them both through a basic obedience class, but still have a lot of learning to do. We will continue to work with them; they are both very smart, but can also be very stubborn (Mya in particular). I also need to be more consistent with the training. It took us a while, but they are both finally potty trained!! Anyway, you have breed some wonderful dogs and we couldn't be happier, we are thoroughly enjoying them both - Thank you!!!! 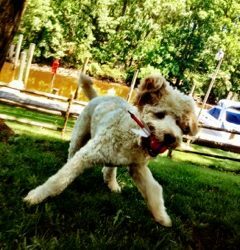 We wanted to write to you and tell you that Scout (parents - Nikki and Dancer) just celebrated his 10th birthday in January! We can't believe we've had him for 10 years but at the same time, can't imagine how life was before we got him. He is absolutely the best dog in the world. He has brought more joy to us than we could have ever imagined and is such an important part of our family. We remember picking him up a small fluff ball with enormous paws. 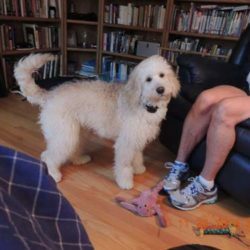 Everyone warned us about us about those paws and indeed, he's the biggest Doodle we have ever seen and we love it. He's remained very thin and healthy at 94 lbs. and considers himself a lap puppy still! He is so smart, aims to please and knows who to be spunky with and who to be gentle with. Everyone loves Scout and he is the love of our lives. 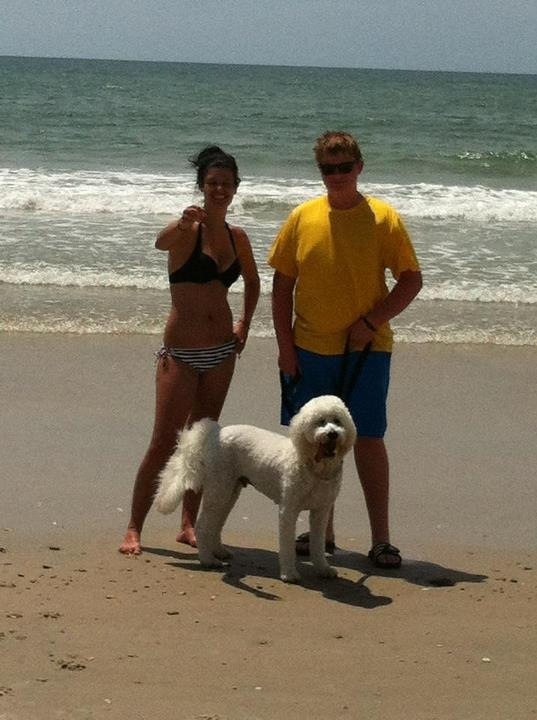 Our kids (one recent college grad and the other a college senior) miss him terribly. 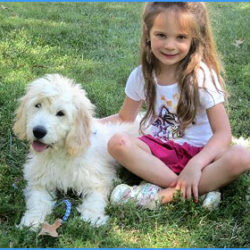 Our daughter has decided that when she is settled, she's wants to get her own "Scout"! 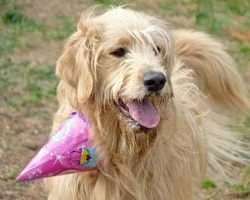 We just wanted you to know about Scout's big birthday and thank you ! The handsome fella (Rudy) wants a friend. 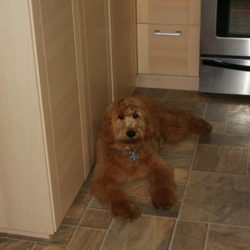 We are looking for another large doodle with the curly hypoallergenic hair like his & the awesome temperament. According to the website it looks like Remi is the only big guy you have. 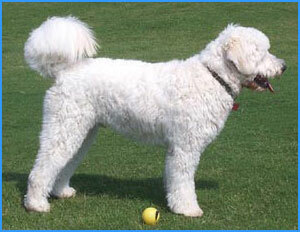 Is he still available & is he hypoallergenic? 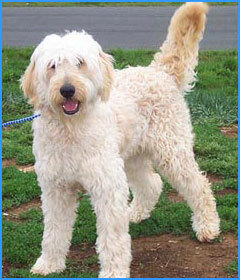 We saw the red doodles earlier & loved them but weren't ready to add another family member. 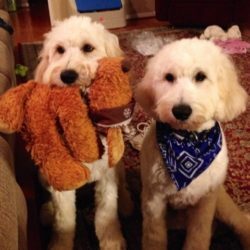 Do you have any more red puppies planned? 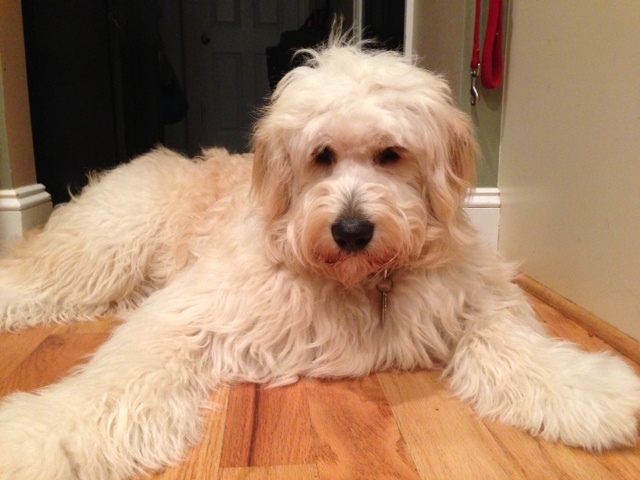 We are the extremely happy owners of Nettles (aka Big Bear) who we adopted from you at 5 months old in January. He is an awesome dog....super happy and mellow. Loves other dogs and people...and has gotten to be a big boy which we love (he is about 80 pounds and tall). I know we "lucked out" when we found Nettles with you because we were looking for a slightly older pup and not a brand new baby. Now, I have a friend who loves Nettles and is looking for a similar situation. Any chance you guys have an older pup again? Just checking to see if there are any litters planned for later this year? 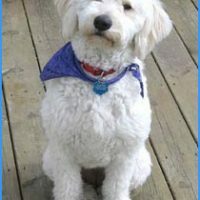 We adopted our golden doodle, Sonny, from you in January 2011, and would love to give him a friend. Please let us know. Sonny has been such a wonderful gift to our family, still waiting for him to start talking to me any day, so smart, sweet, and sensing. Just love him! We wanted to let you know that Hattie is doing very well. She went to our vet today for an introductory visit and got immunizations for Bordetella and Lyme disease. The vet said that she was perfect and had an "athletic heart." Her weight is now 28 pounds. She is quite the character - a real diva... Hank switches back and forth from finding her annoying to racing all through the yard with her. You were right - she tells him what to do, and, for the most part, he does what she says to do. Thank you again for being so accommodating with our travel schedule. We are delighted to have her at last and are enjoying her immensely. 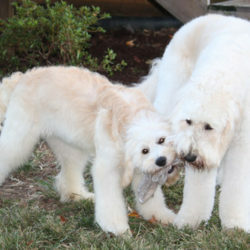 I have attached a couple of pictures of Hattie and Hank. I just wanted to let you know Rocco is doing great! Everyone loves him....He is such a sweet, intelligent, friendly dog. He knows to ring the bell to go out. He knows the following commands: sit, stay, lay. He knows the routine, so no puppy potty accidents. We are so lucky to have him as part of our family. You can say that from the first minute we saw him, we felt in love with him.... Thank you for giving us such a wonderful gift.... These are a few photos. Warm Regards, Jamie and Michael McCloskey. We are just writing to update you on Chandler. 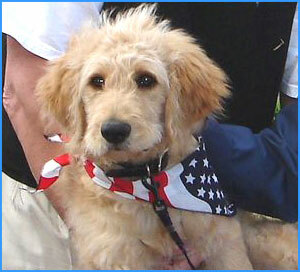 (He was born 12/2009 from Mindy and Outlaw...we picked him up from your office in the blizzard of 2010). Chandler has been such a wonderful addition to our family! He is 1 1/2 years old and weighs 50lbs. 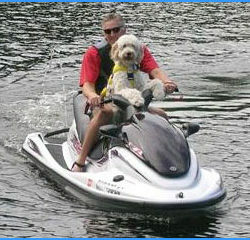 He loves to go swimming, duck hunting and playing with our three girls. 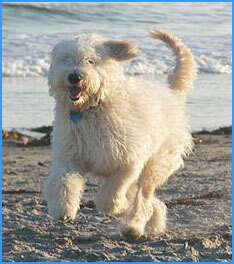 He is a very fast runner and can out-jump any dog we know! Our oldest daughter started doing agility tricks with him when he was 6 months old, he loves it! 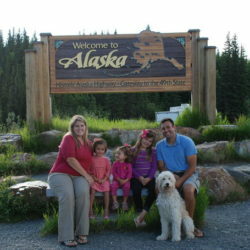 We are in the military and were just transfered from North Carolina to Kodiak Alaska. We drove, and received many compliments about Chandler along the way (we gave them your name and website!) Chandler is adapting wonderfully to Kodiak. 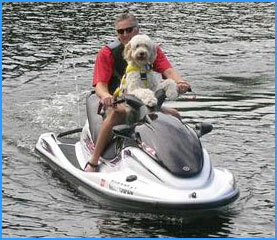 He loves to go on hikes and to go fishing. 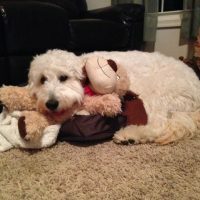 Thank you so much for such a wonderful dog! THE DONOHUE'S (Sean, Natalie, McKenna, Helen, Claire and Chandler). This is Kathi Piette from Racine, WI. 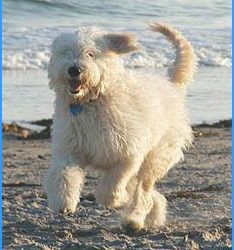 We adopted one of your larger Goldendoodles in May of 2007 and absolutely LOVE him!!! 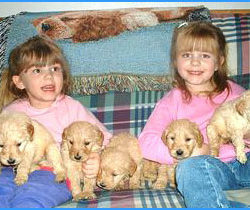 We would like to adopt another dog from you sometime in May 2010. 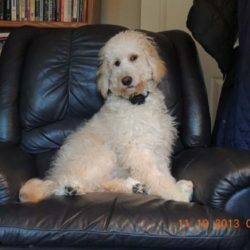 Jake, our Doodle, is a large dog and since we camp every weekend during the summer and fall we cannot accommodate another large dog and therefore are looking into a Cockapoo or small Goldendoodle. 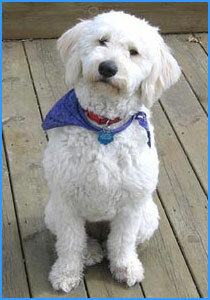 Jake is a certified Canine Good Citizen, does a reading program with small children and visits nursing homes. 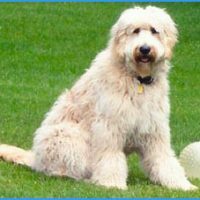 Do Cockapoos have about the same temperament as the Doodles because we would like to do the same programs with the new dog or would you suggest going with a smaller Doodle? 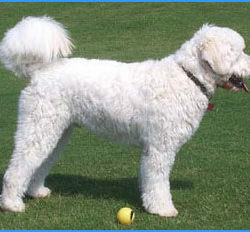 Jake also has the soft wavy hair, which is what we like, do the Cockapoos tend to have that same type of hair or do they have more curly "poodle-like" hair? We would prefer cream, white or buff. 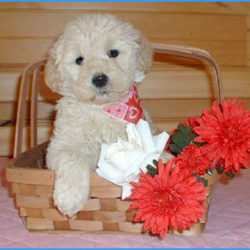 We would like a female but the temperament and personality is more important. Attached is two pictures of Jake. One of when we first got him and another of him now. Jake will be 3 on March 5th. He loves going camping, car rides, his family, playing in the snow and catching snowballs, visiting the senior citizens, but mostly loves all his puppy friends at daycare! 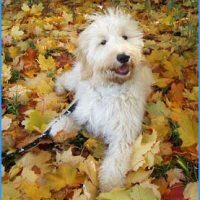 I am so sorry for not writing sooner... it has been "crazy" here while building a house, adjusting to a puppy, and moving into an apartment for 3 months. This good news is we will all survive. Jack is so cute and all personality. 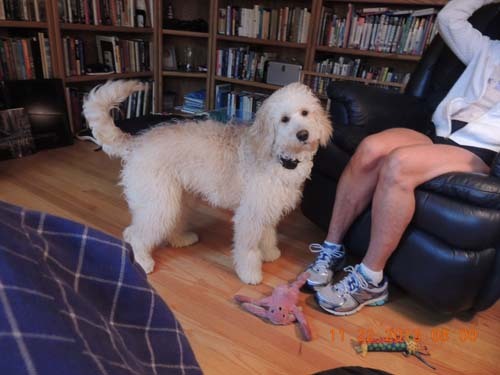 At first he was growing like mad and all anyone could notice was the size of his feet... but now at 5 months old, he is 35 pounds (and still all feet... but says he is willing to go one on one with Fred Astaire anytime)... So we feel that Jack will be well within the weight we were hoping for. I am sending along a photo that we took a few weeks ago... I hope you can see the "Einstein" hairdo that he has developed. Please tell Lilly that Jack seems to take after her Retriever side of the family and she should be proud of such a fine son. We just can't thank you enough for all your guidance. We just love "our boy Jack". He is the Best. Hope all is well with you and the family... will write again soon. iting the senior citizens, but mostly loves all his puppy friends at daycare! Sorry I haven't written sooner to say "THANK YOU" for the best puppy in the world! We have had Roxy now for about 2 weeks. She is from Sammy & Huggy Bear's litter. She is an "angel dog." 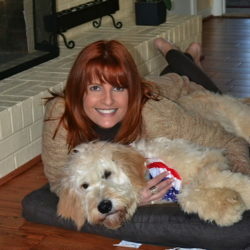 She is so smart, good-natured, laid back & excellent w/our 3 year old and 7 year old children. She was a surprise early Christmas present from Santa. This is definitely going to be one of my children's most memorable Christmas's, thanks to you. Your husband was very informational when we picked Roxy up in Maryland. Thank you for delivering her there. 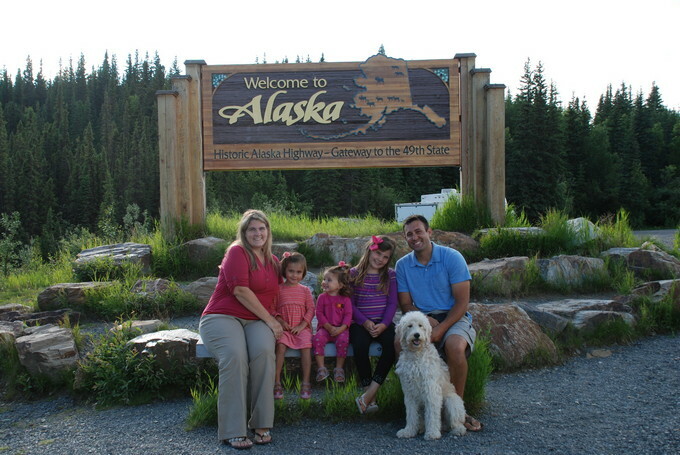 It was only a short hour drive from our house. Roxy did great in the car, she slept most of the way home. 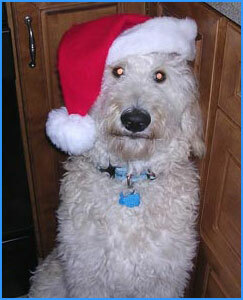 The first night we had her, we crated her in the kitchen and played soft Christmas music on the radio all night. She woke up to go outside about every 2 hours. The next day she seemed to adjust quickly to our crazy household. She is crated every night, has yet to have an accident in her crate, and has very few accidents in the house (we take her out during the day about every hour). She is up to sleeping a 4-5 hour stretch at night in her crate and then goes right back in her crate and sleeps for another 2-3 hour stretch. I took her to the vet the 3rd day that we had her. 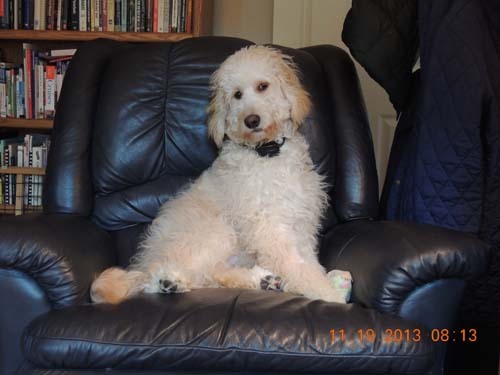 He was very impressed w/ her disposition and commented on how lucky we were to get such a laid back dog. She just laid on the examining table and calmly let him give her a check-up. He was also impressed that you had already treated her with her first 30 days of Revolution. He said that he doesn't see very many breeders that do that. She is going back in next Thursday for shots. She didn't need any shots at her first vet visit, b/c you had already given her her second set of shots they day before we got her. Everyone that meets her falls in love immediately. 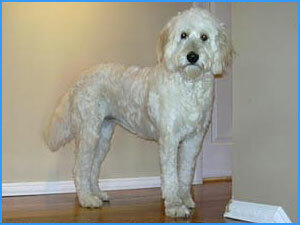 We had prepared ourselves for the "Tazmanian Devil" and instead received the "Angel Dog." She has already won our hearts and is fitting very nicely into our family. 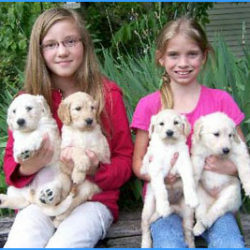 I have a good friend and two neighbors that are going to be getting puppies in the Spring and have asked for our breeder's name. I directed them to your website. Thanks again for the "sweetest dog in the world." You definitely do a great job breeding these dogs. We couldn't be happier. Thanks again and Have a Very Merry Christmas! 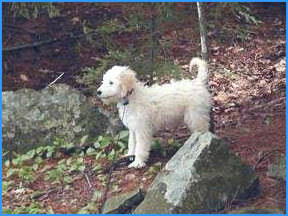 I just wanted to bring you up-to-date on our Goldendoodle puppy, Brie. She is six months old and weighs 35 pounds. Her size thus far is perfect! She is an absolute riot to be around. She is so friendly, playful and well-behaved. We take her to doggie daycare 2-3 days a week and she just loves to play with the other dogs. We love it too...because when she gets home she is exhausted. 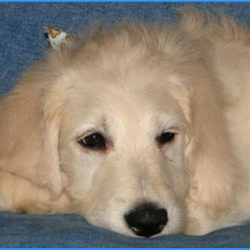 I appreciate all of your correspondence and patience during the process of selecting a puppy. 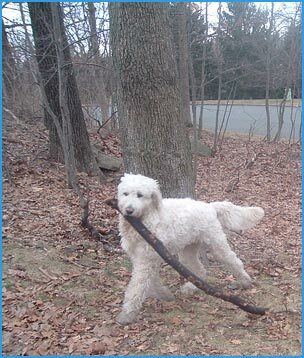 I have recommended you to so many people that question us about our Goldendoodle. I just wanted to drop you a quick note and bring you up to date with our Molly. She was born in November of last year to Molly and Dancer. She has grown up into quite a beautiful young lady. Molly loves to play outside and snuggle inside. There does not seem to be a bad bone in her body, she loves everyone, especially children. She is also an excellent guard dog. Whenever anyone walks by our home, day or night, she is sure to let us know. This has been an unexpected treat. Molly is closing in on her first birthday and weighs approximately 68 lbs. Our Veterinarian feels she may get close to 75 lbs when fully grown. My wife Michele and I wish to thank you for helping bring us a most wonderful and special addition to our family. I apologize for taking so long to give you an update on Chilly. We adopted her from you July 27, 2008. She has been an amazing addition to our family and now we cannot imagine life without her. 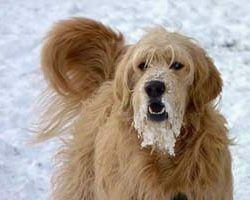 Chilly has grown into a beautiful dog. Her disposition is incredible and we find ourselves giving out your information often. 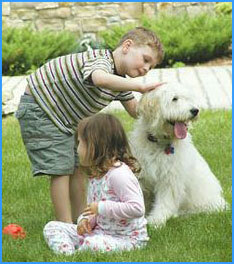 She is wonderful with our two boys (Ty 8 and Tommy 10) and does really well with toddlers and babies. 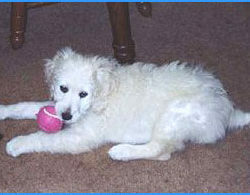 She is very playful and fun but can also be very mellow and laid back when in the house. 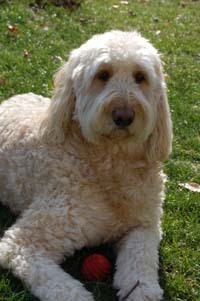 We know many people who have Golden Doodles and they just cannot believe how sweet and calm she is. We put her through training beginning at 12 weeks of age and she took to it immediately. She is very smart and obedient. 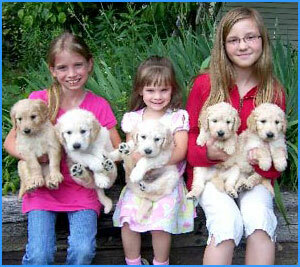 Thank you for breeding such amazing dogs. 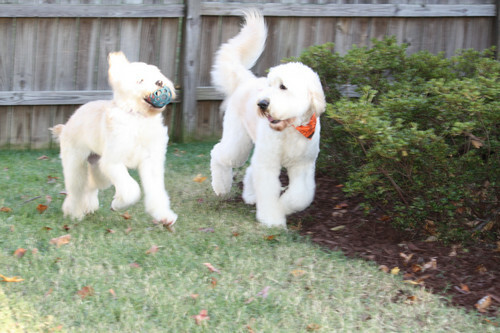 We met a couple this past summer that have two Golden Doodles from you and their dogs have the same disposition. 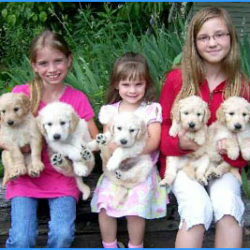 Your dedication to temperament and health of each dog is evident. We are so happy with Chilly and we wanted to say THANKS!! Hello from the Jones family in Garner, North Carolina. Just wanted to write to let you know how much we love our Laurel Ridge Goldendoodle! 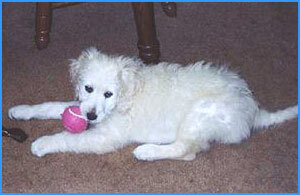 We came to visit you in Blacksburg back in late March, 2008 & went home with our "Phoebe". She will soon be 11 months old. 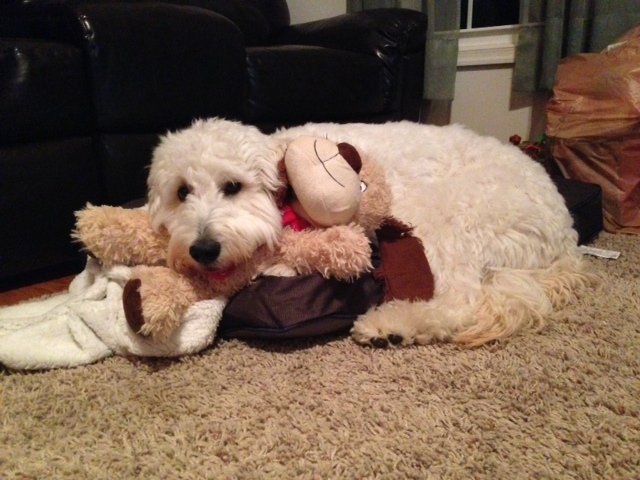 She is very smart and athletic, and is the sweetest, most "huggable" dog we know. Every time we see her from a distance we stop and say " man, that's a good looking dog". 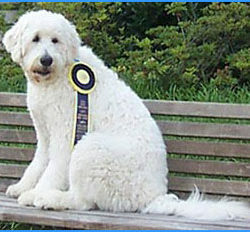 She goes to doggie day care a couple days a week and is known as "miss congeniality". Every day is a happy day for Phoebe. She makes us laugh with her enthusiasm and bouncy energy, and I do mean "bouncy"! 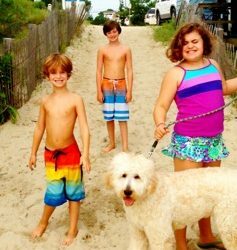 Recently, we also found out that Phoebe's brother "PJ" lives about ten miles down the road from us in Clayton, NC!! His family is Judi and Peter Thompson. 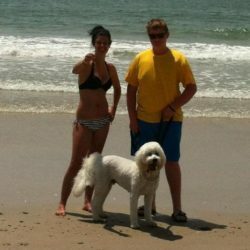 I have attached three pictures of Phoebe and PJ. He is about 70 pounds and she is about 56 pounds. Other than the size difference they almost look like twins. 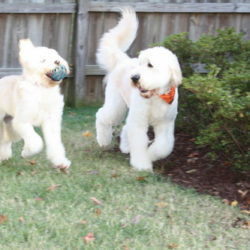 They immediately hit it off and ran around playing until they were exhausted. 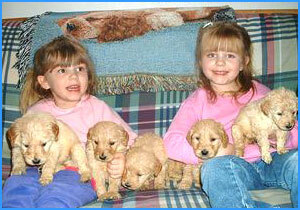 Thanks again for providing such beautiful, lovable dogs (from Iris and Huggy Bear litter January 20, 2008). Thought I would drop you a line and let you know that today is Brandy's first birthday. 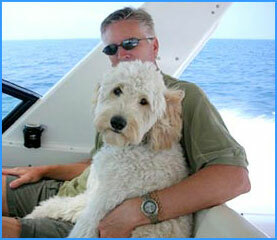 She has been a wonderful addition to our family and has adjusted very well to boating. The pictures say it all. She has replaced me as first mate!! 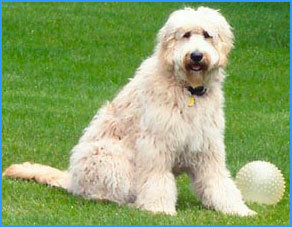 She is Sammy and Teddy Bear's kid and weighs 53 pounds. She is such a joy and attracts attention whereever we go. 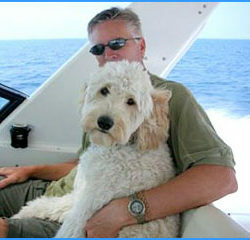 As we come into marinas on our boat other boaters are yelling at us "What kind of dog is that?" As soon as we dock they come over to meet her. 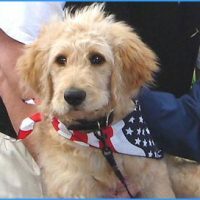 I wanted to share some pictures of “Brewski”, I (The Guilfuchi Family) purchased him from you in December of 2005 as a surprise Christmas present for the family. As you may recall I have various allergies, among them are allergies to cats and dogs! 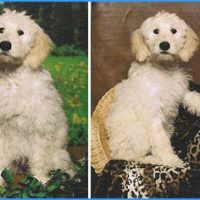 Having a pet was completely out of the question, until research led me to you and your spectacular Goldendoodles. I’m not allergic to “Brewski”! “Brewski” has rounded out our family- he exudes love and is loved. He is definitely a mama’s boy, very caring, smart, obedient, loving and gentle towards others. He will alert us with a low growl and on occasional a bark, to alert us of approaching strangers. He ignores barking from unruly dogs during his long walks. 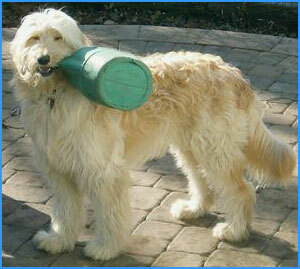 He’s a great ball catcher, retriever and hide-go-seek player! Did I mention he’s the best foot warmer! Kelly and John, we receive some many compliments and inquiries. We truly appreciate the opportunity to have acquired such a great companion, he is the best, please pass along the compliments to your team and the parents. Teddy Bear and Rhiley did an “AWESOME” job! He’s 18 months now and currently weighs a lean 74 pounds! Happy Holidays to you and your family. 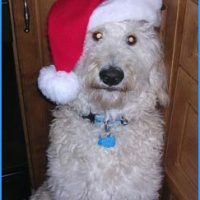 I wanted to share these pictures of our Buddy with you. He is the son of Lily and Dancer and he was purchased by Jay Crowley a year ago in June/July. 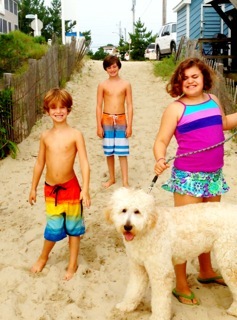 Huggy Bear and Lilly did a great job with Dixie. At 8 months, Dixie is about 65 pounds, same as Huggy Bear, which is pretty good for a girl. 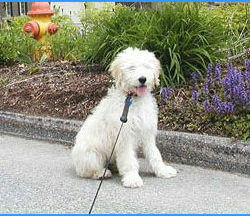 Dixie is full of energy, extremely smart, and a great companion. She is gentle with my 5 Grandchildren and loves people. She rarely barks, but alerts me with a muted woof when the mailman comes. 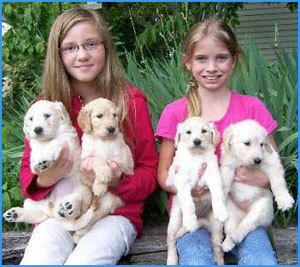 Thank you for breeding these beautiful and loving Goldendoodles.. 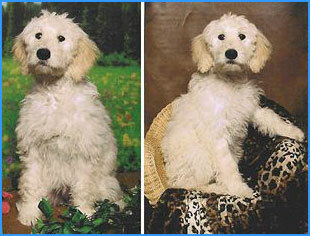 I wanted to share with you about how my sweet 17 month old "Sammy" has grown. Sammy has become my loyal companion. Sammy is so handsome, smart, healthy, gentle, and extremely friendly with a "happy-go-lucky" expression on his face. He has a very confident prance in his walk. 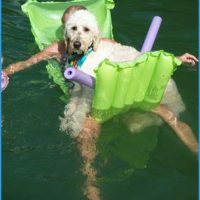 Sammy never passes up an opportunity to go swimming, loves children and has won the hearts of dog owners & non-dog owners alike. 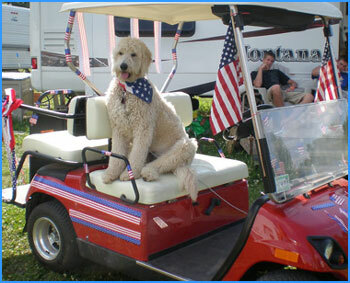 He has been nicknamed the "Mayor" of the dog community in my neighborhood. 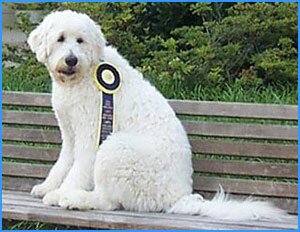 Sammy placed "First" in a local Dog Show for "Best Tail" and received & wore his blue ribbon with pride. Sammy is the first dog I've owned and what a fine prize I have been gifted. 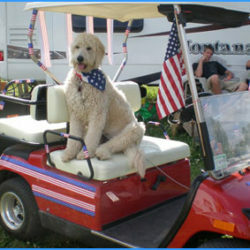 He represents the "First Class" category for the Goldendoodle breed. I sincerely thank you for "Sammy". Attached are some pictures of Sarah's pup "C", or Sophie in Maine. She is a fantastic dog. She loves and is gentle with everyone including children, babies and other dogs, huge and tiny. 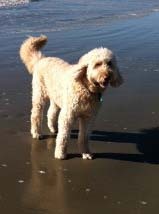 Every nice evening I take her to the beach, where she can frolic with a wide assortment of dog friends. She loves to play in the waves and chase balls into the surf. Just a short note to let you know that Snickers is doing fine. She is about 41 pounds and is full of energy. She is crazy about water of any kind, running through it at top speed and plowing through it with her face. She is lovely after one of these outings. She is also getting along well with Daisy, our Terrier mix. 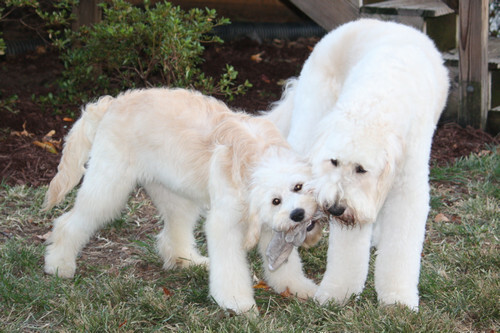 They play together nonstop, snapping and growling at each other, but never making much contact. She’s a great dog and we are thrilled to have her. Here are a couple of photos for your collection. Let me know if you’d like any other information or photos. Take care. I don't think we received your E mail about putting Emma's photo on the your website.. but of course you can... Emma is the daughter of Daisy and Dancer ( I don't think my husband gave you any info with the picture!) She is now 5 months and weighs 27lbs... She is an absolute love, we couldn't have asked for a more wonderful dog! She is doing great in puppy school, is all about the treats with her.. you could ask her to do anything as long as there is a treat involved! Thanks again for breeding such a wonderful dog!!! 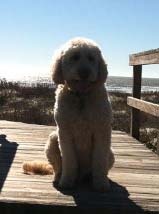 I will send you a Christmas card with a photo of our beautiful Sandie (Goldendoodle) but I just had to tell you how much she has added to our lives. She is just a wonderful playful (and smart) puppy and she makes us smile everyday! We find our whole family sitting on the kitchen floor just hanging out playing with her. 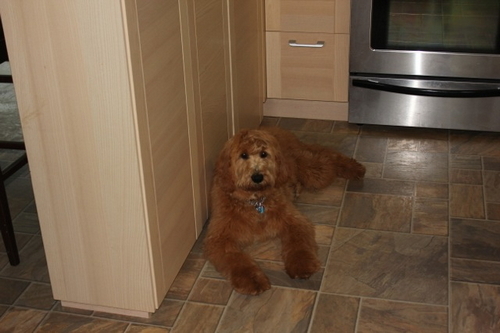 Of course, Sandie does not understand where everyone is during the day – and why she is not getting constant attention!! 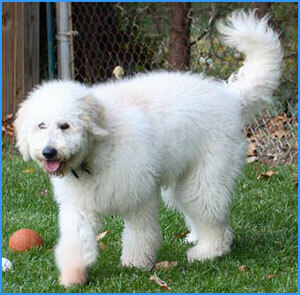 Sandie is just a beautiful dog with slightly wavy fur. 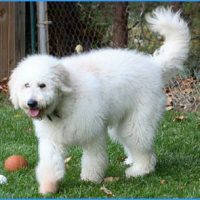 She is around 34 pounds now and we do not think she will get much taller (medium size dog). 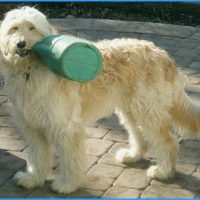 Whenever I am walking Sandie people stop me all the time to ask what kind of dog she is and where is the breeder – so hopefully you are receiving many inquiries from the Chatham, New Jersey area. 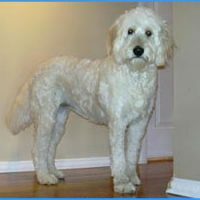 Loren has not had any allergy problems – and very rarely do I find any dog hair anywhere. I thought you might like to know this information. 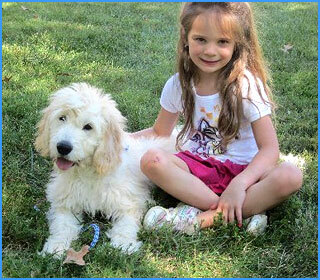 Once again – thank you for such a wonderful loving puppy – she is truly a member of our family! Just wanted to update you on our Molly. She is almost a year old and has grown up to be a beautiful sweet girl. People stop to talk to her at our fence a few times a day and she loves every bit of the attention. 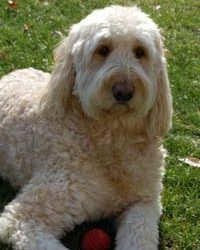 She's a great cuddler and an equally great watchdog which was a surprise to us since we thought a dog called a doodle would be a wimp. Molly is everything we've hoped for and more. Thank you for her. Here are updated pictures that (we think) show her great personality. Hoover just celebrated his 2nd Birthday August 21. He is the son of Huggy Bear and Violet. 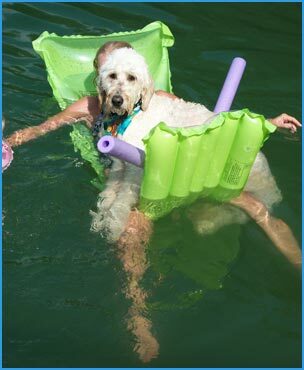 We were beating the heat at Smith Mountain Lake this summer and Hoover like floating on the raft with me. He has been wonderful with the grandchildren as you can see in the second photo. 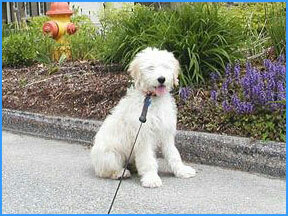 Hoover successfully passed Advanced obedience on May 13, 2009 at the young age of 7 1/2 months. He has been a wonderful pet, very minimal shedding and a real cuddler. Just wanted to drop you a line to let you know how we're doing. 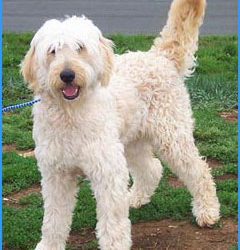 He's a handsome goldendoodle. Here are some updated Pics of Simon@ 1-1/2 yrs old- he is just great - as you can see he is 74lbs, a very good looking square puppy , good wide head----and a really happy go lucky, balanced pup that is everyone's friend- including other dogs. He is exercised everyday and goes everywhere with us (even to Lowes Home Center)- he still has that gentle, medium energy that is very endearing to all. Thanks for breeding the perfect pup!